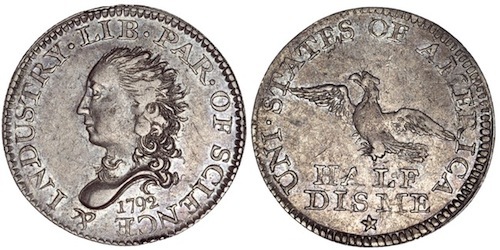 The 1792 half disme (pronounced deem, which later evolved into the modern pronunciation of dime as we know it)) was an American silver coin with a face value of five cents. Throughout the broad range of U.S. coinage from 1792 to the present day, this issue is arguably the most significant of any that has ever been struck. Although still recorded as a pattern issue in current references, most numismatists (coin collectors) now consider the 1792 half disme to be a regular issue coin. Apparently Washington, for international reasons, wanted silver coinage struck as soon as possible; he believed this would establish the authority of the new nation among the nations of the world. The 1792 Mint Act, that had specified the details of the nation’s monetary system, was followed by President Washington’s actions to establish the mint. On April 14, 1792, he appointed David Rittenhouse of Philadelphia, the most renowned scientist in America, director of the Mint. On June 1st, clock maker Henry Voight was appointed acting chief coiner. A little over a month later, on July 9, 1792, President Washington authorized the coinage of half dismes. Just four days later, on July 13, 1792, Secretary of State Thomas Jefferson recorded the following in his household account book: “rec’d from the mint 1500 half dismes of the new coinage.” It should be noted that the “new mint” did not begin to strike U.S. coins for circulation until 1793. British medalist William Russell Birch designed and engraved a single set of dies. He probably used letter punches supplied by Jacob Bay, a Germantown, Pennsylvania, maker of printing types. The obverse of the 1792 half disme portrays the head of “Liberty” facing left, with the date 1792 below. The motto LIB.PAR. OF SCIENCE & INDUSTRY (Liberty parent of science and industry) around the border. The reverse bears an eagle flying left with the denomination HALF DISME in two lines, with a five-pointed star in the exergue ( A space on the reverse of a coin or medal, usually below the central design and often giving the date and place of engraving). The legend UNI. STATES OF AMERICA encircles the eagle. The coinage machinery was in the cellar of saw-maker John Harper while the new mint was being prepared. It was here, at the corner of Cherry and Fifth Streets, where these pieces were struck. They used a private coin press owned by John Harper. One of the popular stories, attached to the minting of these half dismes, was that the silver came from the silverware provided by George and Martha Washington. While the accounts support that the silver came from the president, many believe this was silver bullion rather than their tableware. A well-known painting by John Ward Dunsmore of New York, portrays General and Martha Washington, Alexander Hamilton and wife, Thomas Jefferson, David Rittenhouse, Tobias Lear, Henry Voight and Adam Eckfeldt inspecting half dismes. The actual mintage is not known, although evidence points to 1,500 coins, and this seems appropriate, based on the number that are still in existence today, about 200 pieces. A number of different pattern coins were struck by the U.S. in 1792, but the half disme is the only one that was produced in large enough quantity to be considered a regular issue. Late in the year, President Washington referred to these coins in his national address. For over 200 years, these coins have been among the most prized numismatic items ever issued by the United States. These coins in mint condition have been valued at over one million dollars. 2. Scott, RyAnne. “Money Museum receives 1792 Half Disme from California coin dealer”. American Numismatic Association. 28 December 2012.